You can display video live on a computer by switching to the live streaming mode. 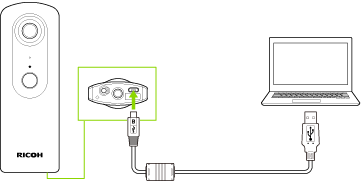 Connect the camera to the computer using the provided USB cable. 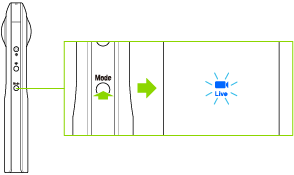 Press the mode button to select the live streaming mode. Howling may occur if the computer speakers are used. If howling occurs, turn the computer speakers off. The following operations are not available with the basic app for smartphone in the live streaming mode. When the camera is connected using a USB cable, you can display live images while powering the camera. However, if the supplied power is low, a battery drain occurs, and the camera power may turn off. Connect the camera to a charging downstream port (USB port compliant with USB BC standard) to supply power effectively. © 2017 Ricoh Company, Ltd. All Rights Reserved.